A favourite treat for hubs in I is to zip out to our local thai restaurant and to gorge ourselves on green curry, beef with basil and pad thai. Without fail, we always ge the same things. Sadly though, this gets expensive, with the usual tab for our indulgence being around the $80 mark. And that's just the financial price.....on top of that, we leave with gorged, stretched tummies and who knows how many calories. So it's always good news when you can replicate takeout at home, in a healthier way, with minimal cost. This comes together pretty quickly, and once you get the chopping done, it's just a matter of heating it all up. YUM. 1. To prepare sauce, combine all sauce ingredients (pretty straightforward, eh?). 2. Prepare noodles according to package directions. 3. 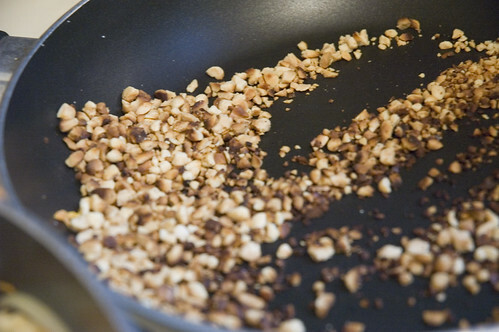 Heat sesame oil in a large skillet. 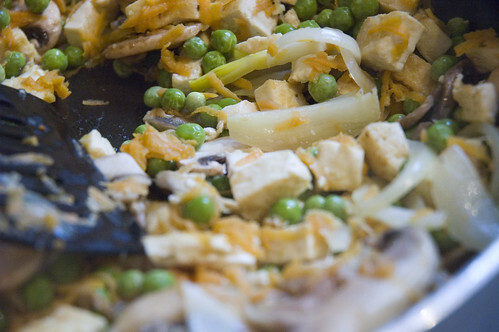 Add tofu and cook until slightly browned. Add garlic and ginger, sauté 2 more minutes. Add mushroom and carrots and peas. 4. Add sauce, cook 1 minute. Stir in coconut milk, cook 2 minutes. Stir in bean sprouts, coriander, peanuts and noodles. 5. Serve topped with lime wedges. Makes 5 servings. 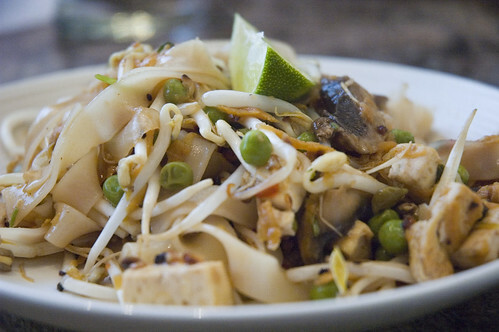 I've tried Pad Thai twice in the past. The first time, resulted in it being called 'Bad Thai' by hubby (the recipe called for 1/4 cup fish sauce). The second time was better, but still not great. I've been looking for a recipe without fish sauce, and without egg (our son is allergic). Hopefully hubby will agree to give it another chance when I try your recipe! Have you made it with chicken? I love Pad Thai with chicken.